At the Rotary Club of Folsom meeting on February 7, 13 teachers from Folsom schools received grants ranging from $150 to $500. Bob Mange introduced each teacher who was at the meeting and presented the checks. Sonny Da Marto, Club Service Director for Rotary Club of Folsom Lake, handed the checks to each teacher. The teachers then told us their grade level and a little about what they were doing with the grant. Back Row left to right - Bob Mange, Rick Berry, Sheila Lauck, Jill DeMarce, Natalie Marhauer, Lindsay Anderson, Dianna Peterson, Kristin Ross, and Chris Jones. Front Row left to right - Kristine Baciocco, Jean Girard, Rob Fergusson, Pam Goldman, and Sonny Da Marto. On Saturday, January 12, several Rotarians under the direction of Justin Raithel, installed the decking on the long boardwalk on the bike trail that parallels Glenn between Sibley and Folsom Blvd. The project started at 8 AM and was done about 1 PM. As usual, refreshments were available. The club demolished this deck on December 16. Photos of the project are available at Bike Trail Project - Long Boardwalk. Demolition photos are at Second Bike Trail Project. On Saturday, November 10, 12 Folsom Rotarians removed a boardwalk on the Folsom Bike Trail. Justin Raithel drove an excavator provided by Bob Blackwell and he was able to pick up sections of the boardwalk and put them in a dumpster. On September 15, 2018, more than 3,300 city volunteers worked on over 70 projects for Folsom Community Service Day. Rotary Club of Folsom members worked hard Saturday morning on several projects serving our seniors. in schools, and in the local and global community. Students and business leaders meet first thing over continental breakfast. Group discussion between students and business leaders. Starting Monday, January 29 and going through Friday, February 9, members of the Rotary Clubs of Folsom and Historic Folsom are giving every third grader in Folsom a dictionary. Below is a photo of some of the third graders at Gold Ridge Elementary School on January 30 after they received their dictionaries. On Saturday, November 11, 2017, the Rotary Clubs of Folsom, Folsom Lake, and Historic Folsom participated in the 17th Annual Veterans Parade in Folsom. Members of the Folsom High School Interact Club and the Folsom Lake High Interact Club marched with Rotarians and Rotary family members. The Rotary group also included three classic cars and four Rotarians on Segways. Rotarians and families line up before the parade. The Rotary Club of Folsom participated in Community Service Day on Saturday, September 16 in a big way. Twenty-six members worked from early morning to late afternoon installing a 13-person Cross Fit rig at Willow Hill Reservoir Community Park. The Rotary Club of Folsom purchased the Cross Fit rig for this park at a cost of $12,500. On Sunday, October 15, the club completed the project with the addition of wood fiber under the rig. On Thursday, August 24, members of the Rotary Clubs of Folsom and Historic Folsom gathered on the Johnny Cash Bike Trail at the Donor Wall for the unveiling of a Rotary plaque. The Donor Wall is for individuals and organizations who have donated to the Johnny Cash Art Experience. Robert Goss, City of Folsom Parks and Recreation Director, conducted the ceremony. Bill Hutto, Immediate Past President of the Rotary Club of Folsom, removed the cover on the plaque for the Rotary Clubs. On Tuesday, March 14, 2017, 50 community business leaders met with 50 Folsom High School juniors at the 22nd Partnerships for Tomorrow Youth Leadership Conference held at Lakeside Church. This conference unites high school students with business and community leaders representing the City of Folsom to discuss leadership skills and ethical choices in the work place, in schools, and in the local and global community. Rob Ross's group discussing traits of a leader. Bob Hoffman's group interacting over lunch. On Saturday, December 17, 16 members of the Rotary Club of Folsom joined 44 other Folsom volunteers and planted trees along the new Lake Natoma trail between the Lake Natoma Crossing Bridge and the Rainbow Bridge. The trail is still under construction and should open sometime next spring. Photo of the trail from Lake Natoma Bridge Crossing. Paul Bonaventure and John Abernethy in back, Ken Stuart and John Messner in front. If you ever thought of going to a Rotary International Convention, next year is the time to go. The RI Convention will be in Atlanta, Georgia from June 10 to June 14, 2017. This convention will celebrate the 100th anniversary of the Rotary Foundation. Going to an international convention is fun and very educational. To learn more about the convention, go to Atlanta 2017. District Governor Nominee Sandra Sava has set up a District 5180 hotel in Atlanta. If you are interested in going to the convention, let Frank Woods know and he will send you the email with reservation information. At the Club Demotion on June 30, 2016, Ramesh Dontha presented a video highlighting the 2015/2016 Rotary year. If you were not at the Demotion or were there and would like to see it again, here is the video. 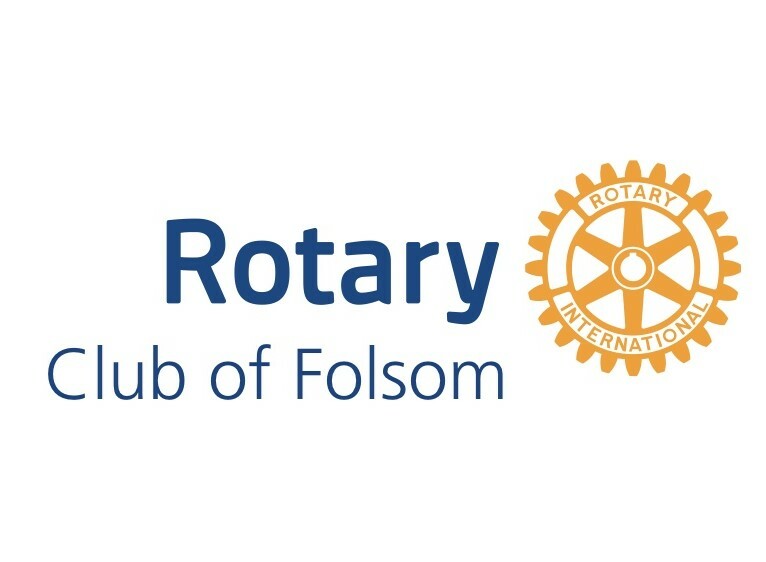 I also posted the video on the Rotary Club of Folsom website. At our regular meeting on Thursday, June 24, 2016, the Folsom Rotary Clubhouse was renamed the Robert H. Miller III Rotary Clubhouse. Over 110 people attended the dedication including former Rotarians, spouses, members of Bob's family, Bob and Candy's high school friends, Chamber of Commerce members, and City of Folsom officials. On Saturday, November 14, several Folsom Rotarians and spouses gathered at the Folsom Zoo to string lights along the fences by the bear enclosures for Wild Nights and Holiday Lights. On Wednesday, November 11, several thousand spectators gathered in the city of Folsom to pay tribute to veterans and active members in military service. 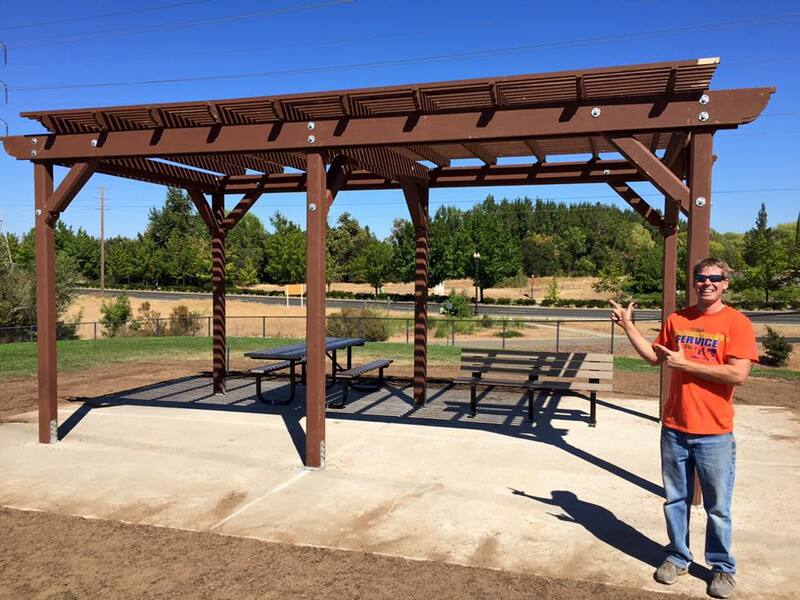 On Saturday, September 19, the Rotary Club of Folsom installed a third shade structure in the dog park at the Cummings Family Park. We were one of 26 projects for Folsom Community Service Day. Photo is the completed structure with Justin Raithel, Community Service Director.